The term "cooling tower" is used to describe both direct (open circuit) and indirect (closed circuit) heat rejection equipment. Cooling towers are heat-transfer units, used to remove heat from any water-cooled system. The cooled water is then re-circulated (and thus, recycled) back into the system. Since the process water is re-circulated, the mineral concentration increases as a result of the evaporation. When the water contains two times the original mineral content, it is said to contain two cycles of concentration. When it contains three times the original mineral content, it has three cycles of concentration and so on. The other half of the cooling loop takes heat from the process through a heat exchanger, condenser or water jacket. Performance of this unit is critical for efficient and economical operation. The heat transfer surfaces must be kept as clean as possible to assure maximum heat transfer. As the mineral content in the cooling water increases, the potential for scaling and corrosion increases, threatening efficient operation of the heat exchanger. The heat transfer surface is the hottest area in contact with the cooling water. The solubility of calcium carbonate (CaCO3 found in cooling water) is an inverse function, with respect to temperature, causing calcium carbonate scaling to occur on the heat transfer surfaces. The accumulation of a CaCO3 scale layer reduces the heat transfer capability, causing corrosion and creating hot spots, resulting in thermal stress. All of which affect the efficiency and life span of the heat exchanger. One basic way of preventing scaling, is to bleed off or blowdown a fraction of recycled water and replace it with fresh water (make-up water) of a lower mineral concentration. A complete analysis of the make-up water is required to determine the maximum concentration of minerals that can be tolerated without causing deposits to form. A direct, or open circuit cooling tower is an enclosed structure with internal means to distribute the warm water fed to it over a labyrinth-like packing or "fill." The fill provides a vastly expanded air-water interface for heating of the air and evaporation to take place. An indirect, or closed circuit cooling tower involves no direct contact of the air and the fluid, usually water or a glycol mixture, being cooled. Unlike the open cooling tower, the indirect cooling tower has two separate fluid circuits. One is an external circuit in which water is re-circulated on the outside of the second circuit, which is tube bundles (closed coils) which are connected to the process for the hot fluid being cooled and returned in a closed circuit. Air is drawn through the re-circulating water cascading over the outside of the hot tubes, providing evaporative cooling similar to an open cooling tower. The purpose of a water treatment program is to maximize the cycles of concentration while minimizing scaling, corrosion and microbiological growth. The most important factor is scaling, which is typically caused by the over saturation of calcium compounds in the cooling water. While the most common usage of cooling towers has traditionally been in the air conditioning industry, many other industries can benefit from cooling tower technology such as plastics, dry cleaning, manufacturing, petroleum refining, electrical generation. In the past, cooling was accomplished by using available water from nearby lakes, rivers or municipal systems on a once through basis. Problems that were encountered included plugging of the heat exchanger by suspended solids (slit or mud) and biological growth within the equipment. The expense of the equipment involved and the increasing restrictions by the EPA, have placed a much greater emphasis on the treatment and re-use of water by means of re-circulating cooling towers. This has significantly reduced industry's demand for fresh water and the quantity of effluent produced. Cooling towers are heat-transfer units, used to remove heat from any water-cooled system. The type of heat removal in a cooling tower is termed "evaporative" in that it allows a small portion of the water being cooled to evaporate into a moving site stream to provide significant cooling to the rest of the water stream. The cooled water is then re-circulated (and thus, recycled) back into the system. Cooling towers may either use the evaporation of water to reject process heat and cool the working fluid to near the wet-bulb air temperature or rely solely on air to cool the working fluid to near the dry-bulb air temperature. The wet-bulb temperature is a type of temperature measurement that reflects the physical properties of a system with a mixture of a gas and a vapor, usually air and water vapor. Where as the dry-bulb temperature is the temperature of air measured by a thermometer freely exposed to the air but shielded from radiation and moisture. In construction, it is an important consideration when designing a building for a certain climate. A re-circulating cooling system re-uses the same water by passing it through heat exchangers, cooling canals or cooling towers to remove the heat that has been transferred into it from equipment or industrial processes. Re-circulating cooling towers affect cooling by evaporation of water, and also by direct heat exchange with air passing through the tower. The basic operating principle is relatively straightforward, but the associated heat transfer equipment varies widely in both cost and complexity. Problems encountered in cooling systems are not usually with the equipment, but with the water that is used, there are three problems which are common to all cooling systems: they are corrosion, scale and biological growth. All water contains some level of impurities which cause scale and corrosion in the heat exchanger equipment. In the tower itself, the combination of air and warm water provide an ideal environment for biological growth. Dust and other particles (dissolved solids) can also be introduced into the cooling tower depending on prevailing environmental conditions, adding to maintenance and treatment requirements. Corrosion is caused by impurities in the cooling water reacting with the metal in the system component. The result is a loss of metal which weakens piping and equipment until leaks or ruptures occur. Scaling Impurities- Most of the impurities in cooling water are alkaline, usually in the form of calcium bicarbonate and magnesium bicarbonate. The higher the concentration of these impurities, the higher the pH* value of the water will be. These impurities, especially calcium bicarbonate, are less soluble at higher pH values. Therefore, acid (usually sulfuric) is added to the circulating water to lower the pH¹ value and increase the solubility of the impurities so they can be removed by proper blow down of the system. They must be eliminated before they have a chance to form scale within the cooling system. If scale cannot be removed physically, either because it is difficult to get to or it is simply too adherent, then acid treatment can be used. By either reducing the pH of the circulating water or a cleaning solution, calcium carbonate should loosen from PVC surfaces. Care must be taken, not to expose galvanized steel surfaces (if present) to acidic conditions. Galvanized steel is very sensitive to any type of acids. The pH of the circulating water should not fall below 6.0. If harsher or more acidic solutions are needed, thorough rinsing is required to minimize any damage to galvanized surfaces. Corrosive Salts- Evaporation is the primary cooling effect of the tower, but as it occurs the concentration of salts in the water will increase. Only by disposing of a percentage of the re-circulated water and by adding fresh water to the cooling tower can the concentration of solids (TDS) be kept under corrosive limits. If cooled water is returned from the cooling tower to be reused, some water must be added to replace or make-up, the portion of the flow that evaporates. Because evaporation consists of pure water, the concentration of dissolved minerals and other solids in circulating water will tend to increase unless some means of dissolved solids-control, such as blowdown, is provided. Therefore, a conductivity analyzer is used to control the "Blowdown Valve" in conjunction with a level measurement in the sump to control the make-up water flow rate. Corrosion can be minimized by the addition of a corrosion inhibitor. Which is a chemical compound that, when added in small concentration stops or slows down corrosion (rust) of metals and alloys. Inhibitors are chemicals that react with a metallic surface, or the environment this surface is exposed to, giving the surface a certain level of protection. This is done by relating inhibitor demand to the acid demand. Whenever the acid pump runs, the inhibitor pump runs also. This is based upon the principle that when fresh water (make-up water with its inherent alkalinity) enters the system, acid is required. Inhibitor is also required. The chemical relationship of a particular acid and an inhibitor determine the proper ratio to be used. The same reasoning is applied to blowdown by conductivity² control. Whenever the blowdown valve is open the inhibitor pump runs, adding inhibitor to another part of the system, balancing the inhibitor loss due to blowdown. Another method would be to add an inhibitor based upon make-up water. A water meter and timer are required to run the pump a given length of time for a given quantity of make-up water. Re-circulation of the cooling water a number of times causes the concentration of the impurities to increase. Since it is desirable to operate near the maximum acceptable concentration in order to obtain maximum water use, and since these impurities are electrolytically conductive, the conductivity value of the water is measured and used to control the blowdown of the tower. A conductivity analyzer can be used to open the blowdown valve when the conductivity level of the impurities present exceeds a given value. This causes a demand for make-up water (with a lesser concentration of impurities) which lowers the conductivity level. Biocides are added on a time basis, such as once per day, twice per week or some other interval. A common practice is to alternate feeding two different types of biocide, not allowing the biological growth to become resistant to one or the other. This "shock" treatment is very successful in controlling undesirable biological growth. 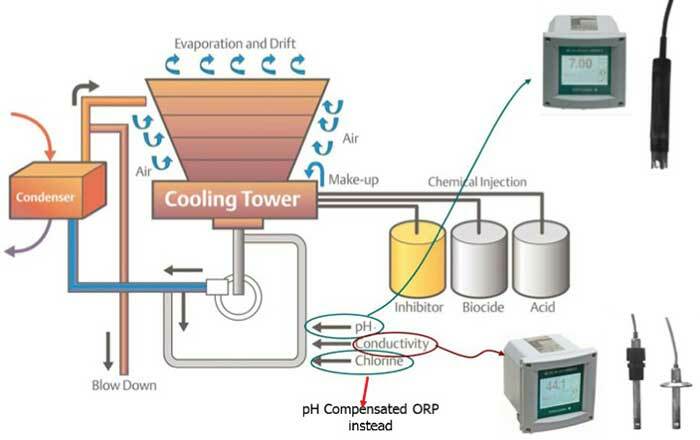 An alternate method is to use chlorine as the biocide, monitoring its active level using an ORP analyzer. Dispersants are added to prevent coagulation/flocculation of suspended solids. They are fed in an alternating fashion with inhibitors, one after the other until the demand is satisfied. pH is a measure of the acidity or alkalinity of a solution. Aqueous solutions at 25°C with a pH less than seven are considered acidic, while those with a pH greater than seven are considered basic (alkaline). When a pH level is 7.0, it is defined as 'neutral' at 25°C because at this pH the concentration of H30+ equals the concentration of OH- in pure water. Conductivity is the measure of a solution's ability to carry an electric current. A voltage is applied across two plates which make up the conductivity cell. The current through the cell is dependant on the resistance of the liquid (Ohm's Law). Conductivity is the reciprocal of resistance; Siemen (conductivity) = I/OHM (resistivity). Most large air conditioning systems, and many industrial processes, require the use of water to cool some other fluid in a heat exchanger. The heat in the water is dissipated by cascading it down the inside of a cooling tower and blowing air through it. A good deal of the water will thereby be lost due to evaporation, but almost all of the dissolved solids will be left behind. Over a period of time the level of dissolved solids will steadily increase until a number of undesirable things begin to happen, including corrosion and scaling. To maintain the efficiency of the heat exchanger and to protect the expensive equipment, it is necessary to "dump" some of the contaminated water and replace it with fresh. Conductivity is the measurement of choice for this blowdown application, while a pH measurement is used to measure and control the alkalinity level of the water in order to prevent corrosion. Most towers can be adequately controlled using just conductivity and pH instrumentation. The "logic" circuit shown in the figure disables the chemical feeds during blowdown of the tower. This saves costly chemicals by not allowing them to be fed down the drain with the solids being removed during blowdown. More complex cooling tower systems include the addition of biocides, inhibitors and dispersants to further protect the equipment.